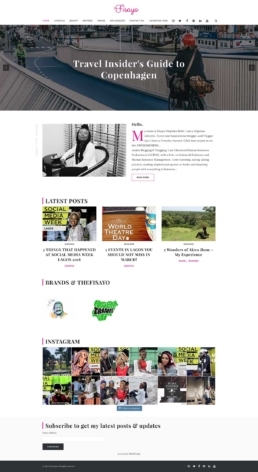 This was a personal project for a friend (A Nigerian Lifestyle, Travel and Inspirational blogger, and Vlogger). Having reviewed analytics and analyzed aspects of her blog that needed improvements. I noticed the amount of effort she put into her work and offered to help redesign the site for free. She wasn’t generating revenue just yet, Obviously she wouldn’t have enough funds to hire a designer. The goal was to fix website responsiveness as 40% of her visitors came from mobile. Improve Brand consistency, Provide a clean site with a focus on content and readability. Social Integration and newsletter subscription. Having completed the website, She got good comments with a mention of the site aesthetic.